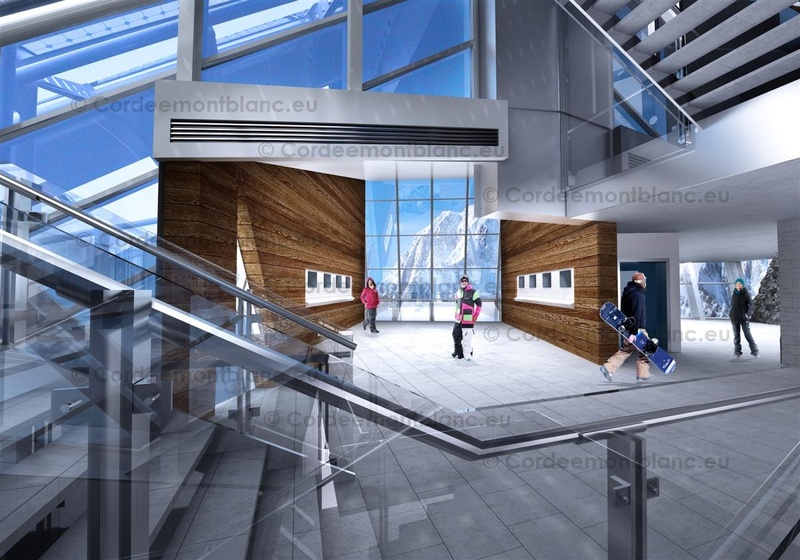 At the Pointe Helbronner station, at an altitude of 3500 meters above sea level, a circular scenic terrace of 14 meters in diameter will be constructed, so as to offer tourists a unique 360 degree view of the Mont Blanc summit (4810 m), the Dent du Géant, Grandes Jorasses and the stunning Vallée Blanche. Because of the extremely limited space available, the station will be constructed in a mostly vertical manner with cantilevered terraces. 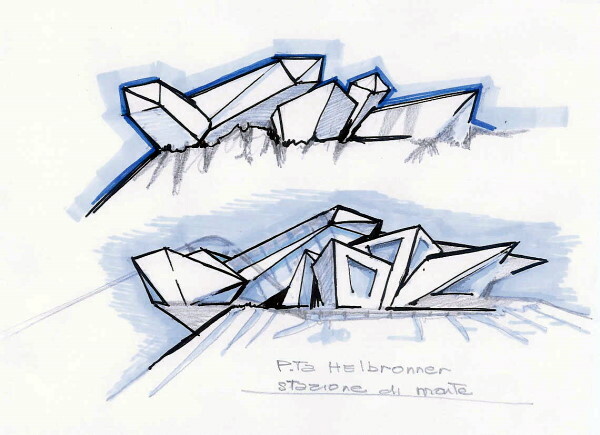 The project emulates the main natural elements of its surrounding environment, defined by large rocky peaks and serracs overlooking the 3000 metre drop, as well as crystals from the Mont Blanc, which have always marked the mountain’s geological history. The extremely free-form design is defined by the profile of each structural element, so as to highlight the natural resilience of the external natural elements. The limited amount of space available has driven the project towards a series of creative volumetric solutions imitating jagged peaks and edges that recall the quartz crystals protruding in every direction, balancing the structure. These angular structures are developed using high performance materials suited for their resistance to the elements and compliant with all thermal, acoustic and resistance requirements, able to prevent the formation of snow and ice on their surface. The entire project is developed on the various slopes as a result of the small area available on the ridge and, while to the south it borders with the Italian station overlooking the steep incline of Pointe Helbronner, to the North it rests on the rocky peak right next to the French Liaison station. The project was envisioned as a permanent outpost in this glacial environment, and as a link to its harsh nature. The unpredictable patterns of its ribbed profiles in different materials (reinforced concrete, metal, wood and glass) supporting constantly different loads that often shift eccentrically. The interior has been conceived and designed as a place that must be in constant contact with the external environment but sheltered from the sheer force of the elements. While the parts of the base under high stress are almost all in reinforced concrete, the higher structures and external facings are in zinc titanium coated steel and are alternated by thick glass windows designed to provide a specific scenic exposure. 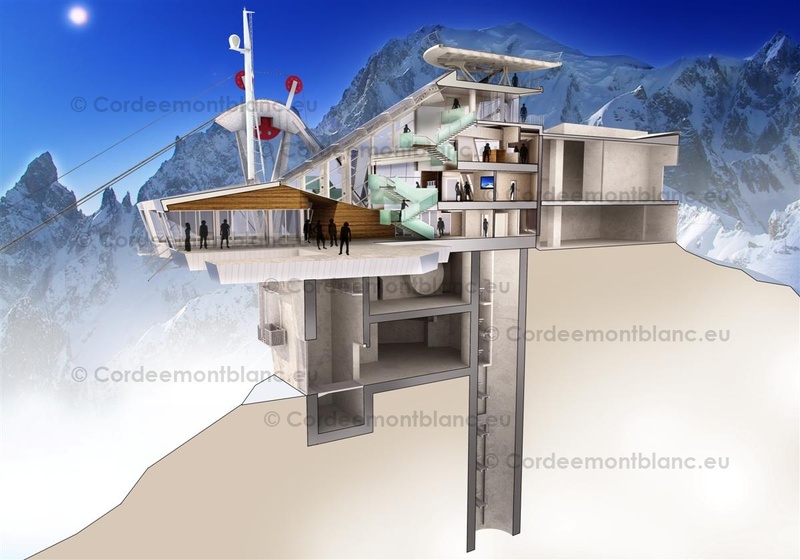 Obviously, the locations chosen to immerse the project in its landscape are: the Mont Blanc, the Dent du Géant and the Grandes Jorasses Glacier. The large panoramic dome is located on the Western side, facing Mont Blanc, and is the main converging point for the whole structure, equipped with multimedia information systems for the public. Nearby, is the self-service restaurant, separated by the rocky 3463 metres peak, which fits into the architectural structure penetrating into the core of the covered environment, acting as backdrop to the panoramic room. 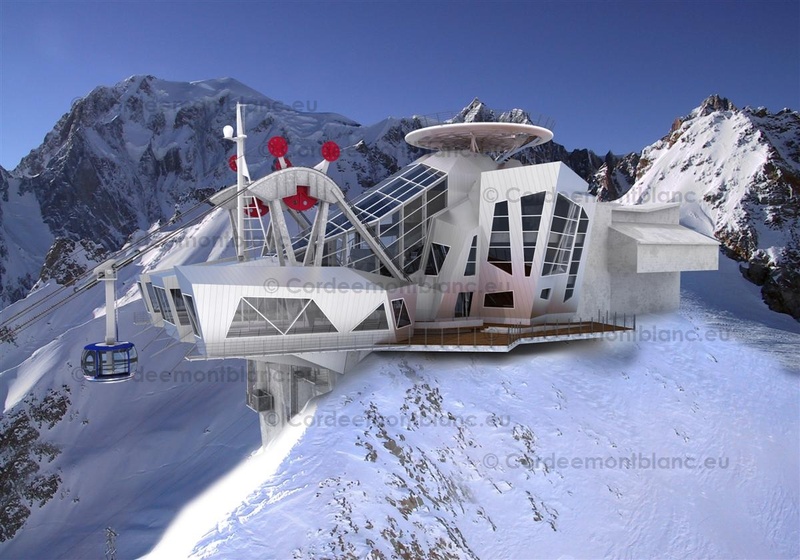 The upper storeys of the reception area host a restaurant with a view of the Mont Blanc, and an exit leading to the external panoramic terrace, erected next to the rocky spire of the French-Italian border. The Eastern side, facing the immense scenery of the Grandes Jorasses, hosts the cafe and the flat path that leads visitors to the Liaison’s departure station (the glaciers cableway). Similarly, outside, on the same side, are the new panoramic terrace overlooking the Dent du Géant and the new pathway leading from the Italian station to the French station. The structure’s highest point leads to the circular summit terrace, offering 360 degree views.